This 150-acre vineyard along the Russian River is part of a 230-acre property. Al White, vineyard manager, has used no-till practices to conserve soil since 1998. Morrison Creek, along the northern boundary of the site, was revegetated through a project as part of the Fish Friendly Farming program. The river corridor is managed to enhance wildlife habitat. 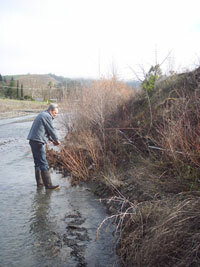 In 2007, La Ribera Vineyards was given an award by Trout Unlimited and California Trout recognizing outstanding efforts in stream habitat improvement and restoration.